Capable of transparent punch to touch-sensitive amp-like textures and fuzzy blast that’s rich in color, Haymaker has it all: it’s great at stacking and complementing your other drives, it’s made by hand in our “small-batch distortery”, and features a gorgeous powder coated 1590BB “big boy” enclosure with top-loading jacks to take up less pedalboard real estate. What are you waiting for, sound clips? Or a user’s manual? 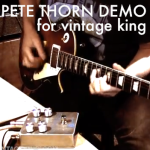 Want more video demos? 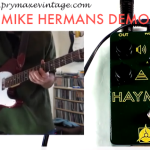 We can do that for you – check out the fine work of Mike Hermans for Prymaxe Vintage, and Pete Thorn for Vintage King – just click on the images or links. Not sure which Caroline drive pedal to get, Haymaker, Cannonball, or Wave Cannon 2? Check out this handy explanation.